Monnar Motorsports: Last Purchase Before Winter Sleep! Last Purchase Before Winter Sleep! Decided to pull the trigger early on replacing my brakes as opposed to waiting after winter. The pads were starting to squeal a bit here and there, telling me it was soon time to replace them and probably would last the first and second event of the following year. 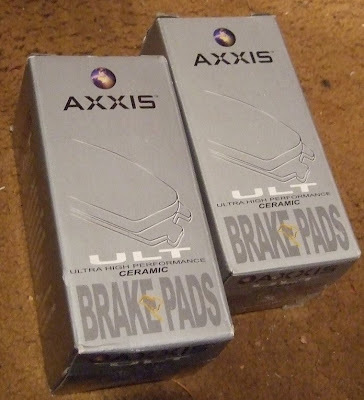 I went with the Axxis ULT Brake Pads (previously known as Axxis Ultimates) as they have been praised again and again by autocrossers for their great braking ability, consistency, low dust, and good initial bite. Not as hard of an initial bite as a warm set of Hawk HP+ pads, but the overall braking is apparently identical, with a higher brake fade temperature as well. The pads will be matching up with all new rotors as well. Stock size two-piece rotors from Racing Brake will do the trick here. The rotors are much lighter than the stock rotors, with the front rotors 4.4 lb lighter than stock, and the rear rotors are 2.5 lb lighter than stock, with slots for ventilation. Can't wait to install these on the car, hoping to get this done before the snow comes! UPDATE: Just found out that we are expecting a snow storm this weekend, so unfortunately it looks like these will not be installed until after winter. Unfortunate but March is only 4 months away!